With the FEMALE COMFORT FIT Advantage Urinal System and it's patented design, urine rapidly drains from the urinal, through the tube and into a pre-attached 2-liter collection bag, leaving the urinal Empty and Ready for the next use. Having an empty urinal throughout the night greatly reduces trips to the bathroom, falls, caregiver burnout, spills, linen changes and infections. This system is designed for continent women with the ability to sense the need to urinate. Advantage Urinal Systems allows the individual and their caregiver increased rest and sleep. The new, patented padded rim provides a better seal and extra comfort which no other urinals provide. This amazing system can be used all night, throughout the day, while traveling and camping. 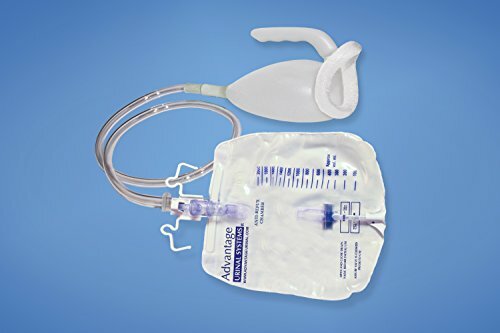 The down drain bag is equipped with an anti-reflux valve, decreasing spills and odors and eliminates the need for a lid. Every Advantage Urinal System Model has been designed to save time and money while promoting independence and dignity. This System is easy and comes ready to use. Follow tips on the included packaging for best results. Reduces falls, caregiver workload, odor and briefs. The COMFORT FIT FEMALE model with it's Unique padded rim creates a better seal and increased comfort. This System is portable, Re-useable, easy to clean. The Advantage Systems save time and money while promoting dignity and independence.